A ‘paranoid’ man stabbed a great-grandfather to death because he thought he was tailgating him, a court heard. Matthew Daley, 35, of St Elmo Road, Worthing, told police he stabbed Sussex pensioner Don Lock 39 times because the 79-year-old was being aggressive and he was scared. The attack happened as Daley was driving his Ford Fusion along the A24 in Findon, on July 16 last year, at around 8.30pm. The court heard Mr Lock, a keen cyclist, was driving behind Daley in his Toyota Auris when Daley suddenly braked, causing the pensioner to go into the back of his classic car at around 16mph. Jurors were told the defendant grabbed the victim in a bear hug as he repeatedly stabbed him. At the first day of Daley’s trial, at Lewes Crown Court today, jurors heard that he then hid his car and tried to clone the registration of a similar car to hide what he had done. Philip Bennetts, prosecuting, said: “Matthew Daley was heading south on the A24 in Findon. Donald Lock was travelling behind and collided with his car. “Donald Lock got out of his car and went to speak to Matthew Daley. As he got out of his car and approached the rear of the car Matthew Daley stabbed him repeatedly. “He fell to the ground and he stabbed him as when he was on the floor. As a result Mr Lock died and Mr Daley drove off. Mr Bennetts described how a witness was driving behind Mr Lock when she saw Daley perform an emergency stop. He said she thought it was ‘completely out of the blue’. A post-mortem examination revealed Donald Lock suffered 39 stab wounds to his chest, back, neck, and head, with the fatal blow severing his aorta. 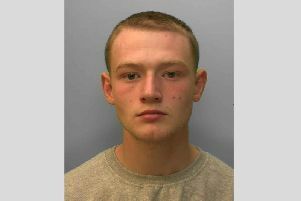 Daley was arrested near Worthing Golf Club with a knife in his rucksack two days later. The court heard that Daley had a history of mental illness and was diagnosed with autism, as well as psychosis, by NHS doctors. His father, John, had pleaded with mental health staff to help his son prior to the attack. David Howker, defending Daley, said: “The events last year were a tragedy, that is beyond argument. That Mr Daley suffered from mental health problems is not disputed. “Mr Daley suffered from paranoia, hallucinations, delusions. His abnormality caused him to perceive this aggression in Mr Lock. “He did not act how you or I would in that situation. He misinterpreted the situation he found himself in.